Today we have one more of these very familiar stories from Jesus life. Jesus visiting two sisters Martha and Mary. It may seem that there is nothing that important it this story. 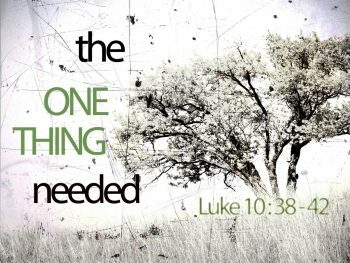 But today we’ll try to see that here Luke portrays two radically different understandings about what God expects from us. All people in the world have either one of them or the other. In one of them people focus on themselves, on their own attempts to be good in their own eyes, and in the eyes of God. In the other, they focus on Jesus and on His message, on what He has done, does and will do for us. And these two understandings are as far one from another as heaven are from earth. The former brings anxiety and worries, the latter brings peace and joy and freedom that remain forever. Here we already can see these two understandings unfolding. Who welcomed Jesus in her house? It was Martha. But what did it mean – to welcome a teacher of God’s Word? What would be the proper way to welcome someone who brings God’s message? The most important thing would be to listen to this message. To welcome God’s messenger, any God’s messenger, is first and foremost about welcoming his message and listening to what he has to say. It was true then, it is true now. As we can see even if Martha was the one who welcomed Jesus, she missed the most important part, that is, paying careful attention to His message. Mary, on the other hand, sat at Jesus feet as it was appropriate for students and listened to Jesus’ teaching. She did exactly what was expected from someone who truly welcomes God’s messenger. “But Martha was distracted with much serving.” She was focused on her actions. Now is the time we can raise our objections. Yes, but who would do all the stuff around the house if everyone was just sitting at Jesus feet? Someone has to work, we can’t all simply sit and listen to Jesus. When we think about Martha vs Mary, we often think about ourselves. That’s what makes our objections even more passionate. Someone has to get things done, we can’t all just sit and listen. True? False. We read that Martha was distracted with much serving. Not simply busy with much serving, but distracted. Distracted from what? From the most important part of welcoming Jesus, from listening to Him. Martha was very focused on what she had decided to be the most important things, on much serving. It is not difficult to imagine how annoying it may be when you run around doing really important stuff, while someone else does nothing. I guess we all can relate to it. It can make us angry. What is going on? Why don’t others help me? We can picture how Martha was getting angrier and angrier; the person who had to help her the most, was sitting at Jesus feet and listening to what He was teaching. Finally “she went up to Jesus and said, “Lord, do you not care that my sister has left me to serve alone? Tell her then to help me.” If you believe that you are doing the right thing, then, of course, you are sure that even God is on your side. That’s what people often believe. We love when we do something that we consider important, we are on our mission, we feel great about ourselves, and sometimes we can even look down on others who don’t do important things that we do. And don’t you dare to ruin my plans! Mary was ruining Martha’s plans, and Martha couldn’t allow this to happen. You know that when we are worried and angry we sometimes don’t think much before we say something. Jesus describes well the situation Martha was in. We all know situations like this. We may be stressed that things don’t happen our way, that others don’t do their part to help us, and even those whose support is so crucial seem to be indifferent. You are left battling on your own. And in situations like this it is easy to get focused on our own actions and to forget what is really important. The one thing which is truly necessary – listening to Jesus. Mary had chosen the good portion, it will not be taken away from her. Let’s talk about this more. Sometimes people look at this story and try to pit two things one against other. On the one hand, doing stuff, being active in doing good, on the other hand, being passive and listening to Jesus words. These then are portrayed as two opposites. Either being active in service to others, which obviously is a good thing, or passively spending time listening to Jesus, be it in the Divine Service, on in Bible studies, or in our home devotions, which doesn’t seem that good, for it doesn’t accomplish much. Usually these things are portrayed as opposites by ‘Marthas’ of this world. “Should then we all just do nothing?” But they are not opposites. They are actually two inseparable aspects of being Christian. However, one of them is infinitely more important that the other. As I said in the beginning here we can see two very different understandings about what God expects from us. Martha was sure that the most important were her acts of service, that this is what God wants from us, and most people probably would agree with her. However, Jesus said that the one thing that is necessary for us – is to listen to Him. But how can passive listening to Jesus be more important than serving others? But what if we asked this question differently, – what is more important, what we do, or what God does? What are more important – our works or God’s works? If we put our question this way, then the answer seems obvious. Of course, God’s works. When we serve others, these are our works. They are good and needed, and we are created to serve our neighbours. No doubt about it. But when we listen to Jesus in the Divine Service, or in Bible studies, or in our home devotions, then it is God’s work. That’s right. Remember, our God does everything by speaking. By speaking He created the world, by speaking He sustains it. By speaking He calls people out of this world, gives them new hearts and brings them into His Kingdom. When we listen to Jesus’ words, God Himself is at work. Calling us to Himself, restoring us, creating in us new hearts, making us wise, equipping us for the service to others, giving us His peace and joy. When Jesus speaks to us, we receive the Holy Spirit, and when the Holy Spirit is given to us, He is a guaranty of our inheritance in God’s Kingdom. Do you see how great is this difference? Our works are for our neighbours, for this world, needed and good, for sure. But listening to Jesus is for eternity. Our works are about temporary wellbeing, listening to Jesus is about eternal life. When people think that their works are of ultimate importance, there will be a lot of troubles and anxiety. We want to be good by what we do, and we struggle, for this is broken world. Often we fail and are distressed, often everything seems to be against us, often others don’t appreciate what we do. And when we succeed, we are tempted to consider ourselves as better than others. In this scenario our peace and joy, our worthiness and goodness depends on our success. It is so different when we realize that listening to Jesus is of ultimate importance. He speaks and eternal life is given to you. You listen to words of Jesus, and the Holy Spirit is given to you. You listen and Jesus reveals His love to you. You listen and Jesus assures you that everything is done so that you could be with Him forever. You don’t need to prove yourself by doing good. You have all God’s promises already. You listen to Jesus and He makes you wise. He teaches you how to serve your neighbours better, how to give them what they truly need. You listen and the Holy Spirit changes your hearts, and you desire to do good to everyone, especially to brothers and sisters in Christ. You listen to Jesus and He sends you to love your neighbours as God loves you. And when you do it, there is no need to be anxious and troubled, for your goodness and worth don’t depend on what you do. It depends on Jesus. You are free to serve others. Free. You may be at peace. Loved. Saved. Having all God’s promises. Being made co-heirs with Jesus. Knowing that this portion will not be taken from you. Ever. How good is that! This is what we can learn from this little story. There are two ways to think about God. Anxious and troubled way where everything depends on our performance; if we are good enough, then hopefully God will be good to us. But if we are honest, we all know how imperfect we are. The other is way of peace and joy, where God Himself takes care of you. You simply need to receive His care and His gifts. This is Christian way. This is what following Jesus means. Sitting at His feet, listening to His teachings, and rejoicing in His Spirit. Amen.